In February Google announced that it was looking to roll out its ‘Accelerated Mobile Pages’ (AMP) standard to emails. Exciting, right? There are great opportunities for increasing engagement with your emails, for sure, but AMP for email also throws up some difficult questions about Google’s increasing control over the internet. We’ve broken down everything you need to know below. AMP is a model for building web pages that Google has created: the code you use is much simpler than a normal HTML page but it loads very quickly (typically under a second). Because the page loads quicker, Google also prioritises AMP pages in its search results. The trade off is you aren’t able to do as much on the page when it comes to design and layout (because the code required is simpler). Now Google is proposing using this format to create a new standard for coding in emails. According to their announcement, it’ll allow you to do things like fill out forms (such as petitions), browse Pinterest and check your colleague’s calendar availability from within an email. Google is definitely rolling this out to Gmail and it’s possible that other email providers will become compliant too. This is the first major fundamental change to email as a content channel in a long time, and could have a huge impact on your email programme. AMP for email creates the prospect of being able to tailor email content to recipients in a way that standard in-email personalisation functionality (while useful) can’t. AMP means you’ll be able to show each reader different content based on their interactions with the email. Google have released a technical specification which suggests this could be everything from allowing users to browse through image carousels to having a chatbot-style conversation directly within the email. You’ll be able to use this flexibility and interactivity to make your emails more engaging, and, as we know, more engaging emails are more likely to be opened and acted on by your supporters. 21% of email is sent via Gmail, so there’s a huge opportunity to increase the value and engagement of your list even if no other email providers adopt AMP. Being able to put forms and other dynamic content in emails has a huge range of applications that could increase your action rates and make your email list more valuable. The spec that Google published when it made the announcement suggests that you’ll be able to put forms within the email itself using AMP. This creates huge potential to put petitions, surveys and donation forms right within the inbox itself. 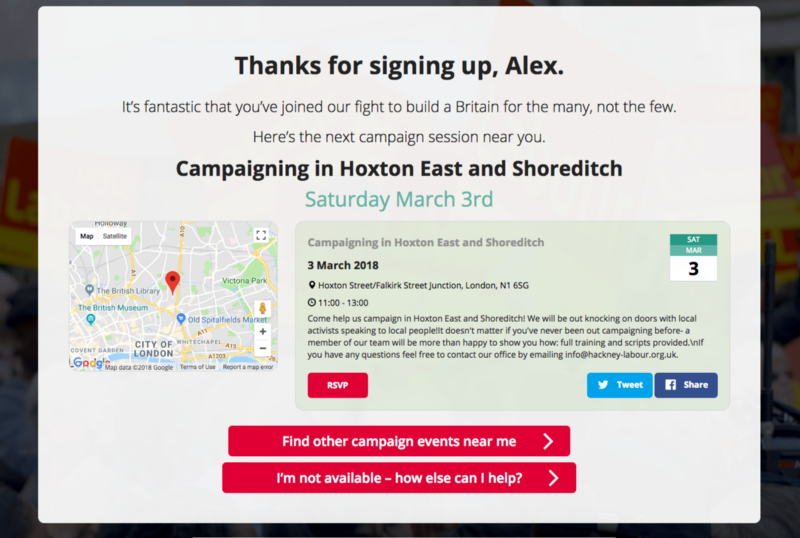 Let’s take this Labour volunteer signup journey as an example. AMP would, in theory, make it possible for Labour supporters to pledge to volunteer, be automatically shown their next local event, then RSVP to say they’re attending, all without leaving their inbox. No more losing users on the way to slow-loading web pages, and no more losing users as you redirect them between different action pages (although sliding, all-on-one-page signup journeys are also a good solution to the latter problem). The whole point of AMP for the web is to improve the quality of experience for users. It makes web pages super quick to load. 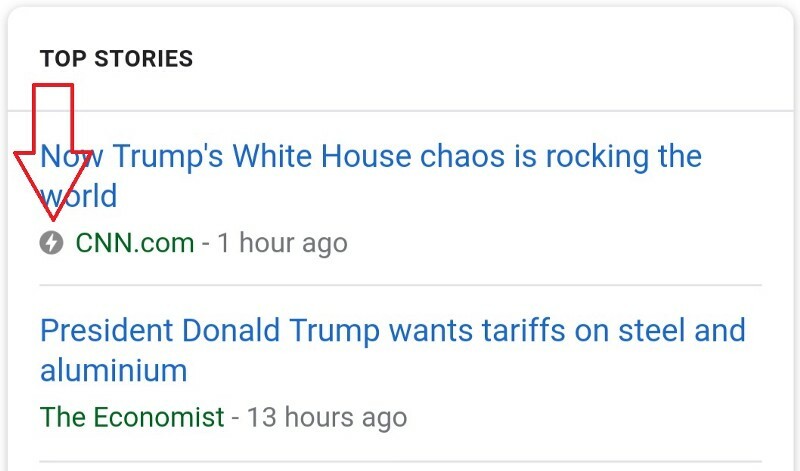 As a result, Google prioritises AMP pages where it can. In line with its guidelines on SEO, it punishes pages that are slow to load and inaccessible, and prioritises those that adhere to it’s guidelines on what a ‘good page’ looks like. The details are still unclear, but it’s possible that AMP for email presents the same opportunities for content providers willing to fit their content around Google’s specification. It’s feasible that emails that use AMP for email could be prioritised in inboxes for users because they would be easier to use and more engaging. A major downside of this announcement is that Google is setting the pace for email content in the way that AMP does for web content. For the third sector, which is already chronically dependent on Facebook to reach its audiences, an argument about creating another walled garden is certainly food for thought.